If the soul of Argentina is football, then the heart is the asado. A mound of charcoal made of native trees, an open pit, and a lattice of metal heaped with the finest beef, pork, or chicken: the asado is as much a social event as it is a means of cooking. Asados are often the centrepiece of gatherings, the two to three hours of cooking time ample opportunity to catch up with friends and family. And after the cooking comes the eating. While salads and wine are the key accompaniments to the asado, meat is the reason for it. In Argentina, various cuts form the basis of the asado. The main event is the vacío, a slab of marbled beef that sizzles and explodes with flavour. Matambre, a very thin cut of beef taken from between the skin and the ribs of the cow, is hugely popular and is sometimes used to wrap vegetables, eggs, and herbs. These flank steaks derive their name from the Spanish words matar and hambre, meaning ‘to kill hunger’. Costillas, or asado de tira, a fatty rib cut, are also often served, as is chivito, or goatling, and even offal. Cooked at an angle to avoid the fat dripping onto the coals and creating a smoke that can dry the meat. Seasoning is done by salt alone, and the cuts are not marinated: the quality of the meat is so good that it only needs to be cooked slowly to fall apart and taste delicious. The classic Argentine condiment is chimichurri, a green salsa of parsley, oregano, onion, garlic, chilli flakes, all mixed in olive oil with a splash of vinegar or lemon juice to add a shard of acidity. This is often splashed over the cooked meat, or added to piles of roasted vegetables. The essence of asado is friendship and hospitality, the coming together of family and friends around the warmth of the charcoal-fuelled fire and the drifting smell of cooking meat. Argentina is renowned for its hospitality, the importance of the Sunday lunch outdoors, gathered around the smoke of the asado, a symbol of warmth and friendship. Born of the campfires of the gauchos, a gathering under the vast expanse of the Pampas sky, surrounded by grasslands and the cattle that call them home, nothing sums up Argentina more than the asado. The vast expanses of Argentina’s Pampas, the fertile lowlands that cover much of the southern area, filled with cattle after their introduction in 1536 by Spanish conquistadors. 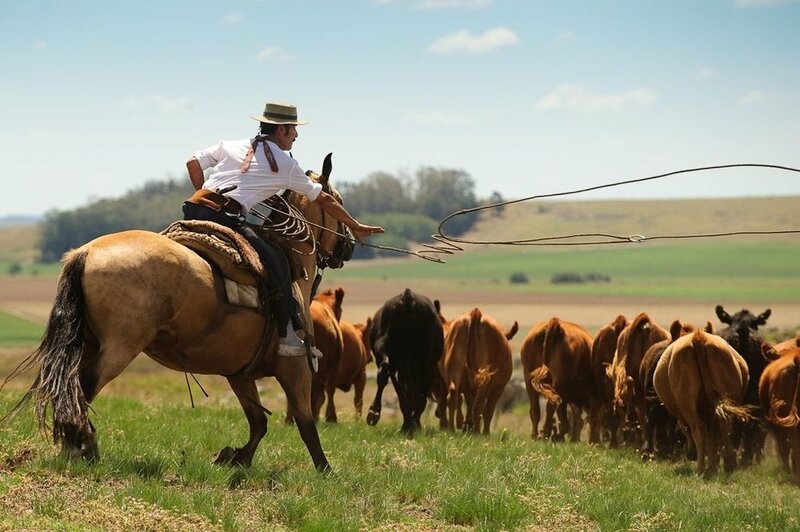 The 19th century saw the expansion of Argentina’s transport system and the Pampas became a global centre for the production of some of the finest beef in the world. The history of Argentina itself is utterly intertwined with the history of beef. Two of the country’s most identifiable cultural phenomena, the gaucho, or cowboy-rancher, and the asado, an open-air barbecue, would not have developed without the cattle trade. As the export of beef took off, the political centre of Argentina, Buenos Aires, was saturated with money and a huge round of construction work occurred, as well as charity work and huge social gatherings such as the La Rural agricultural show. Even the explosion of Argentine football in the late 19th and early 20th century can be traced, in part, to the expansion of the beef industry, as British workers on the railways formed clubs like Rosario Central and Talleres, and wealthy beef landowners put money into clubs as a form of social philanthropy. Of course, while the country exports a huge amount of beef, it is also the second largest consumer of the meat in the world and, with the asado so central to Argentine culture and identity, and the beef so tasty, it’s not hard to see why. Currently, there are some 55 million head of cattle in Argentina. Argentine beef is known the world over for its rich flavours and strong tradition of heritage farming, and many of the cattle in Argentina are still grass-fed, relying on expert rearing and the rich, fertile lands of the Pampas. Hereford, Charolais, and Aberdeen Angus are among the most popular breeds, though many others are also bred and farmed. The Argentine cattle herd, spread out across huge areas of lush grass and watched over by the gauchos, is an iconic image of the country. Beef is and always will be associated with the very essence of Argentina, its history, its culture, and its economic future.